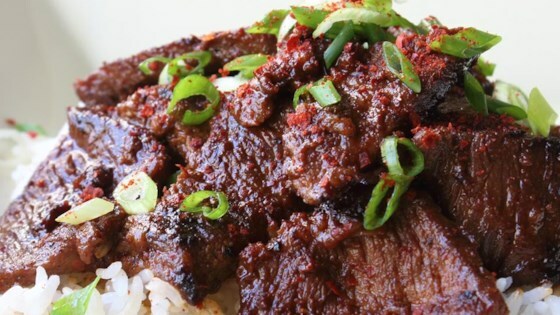 "In the best examples I've had of beef bulgogi in Korean restaurants, the meat, while tender, still had a little bit of chewiness to it. You can control texture by the thickness or thinness of the slices and how long you marinate them. But this is a fairly fast-acting marinade, so I go with an hour or two." Mix garlic, grated onion, grated ginger, toasted sesame oil, brown sugar together in a mixing bowl. Stir in grated pear, soy sauce, and chile flakes. Transfer meat to marinade and toss to coat on all sides. Cover and refrigerate 1 to 2 hours. Season meat with salt and a drizzle of vegetable oil. Toss. Brush a cast iron skillet with a little vegetable oil and place over high heat. When skillet is very hot, add beef in a single layer and cook until meat begins to caramelize around the edges and moisture begins to evaporate, 2 to 3 minutes per side. Serve over hot rice and top with green onion slices. The secret to Chef John's incredibly flavorful short ribs is in the marinade. You can marinate the beef for up to 12 hours, but I have good results with a 1- to 2-hour marination time.